Umberto II, born Umberto Nicola Tommaso Giovanni Maria di Savoia, occasionally anglicised as Humbert II (full anglicised name: Humbert Nicholas Thomas John Mary, o Savoy) (15 September 1904 – 18 Mairch 1983), wis the last Keeng o Italy, reignin for slichtly ower a month, frae 9 Mey 1946 tae 12 Juin 1946. 15 September 1904 – 29 September 1904: His Ryal Highness Prince Umberto o Savoy. 29 September 1904 – 9 Mey 1946: His Ryal Highness The Prince o Piedmont. 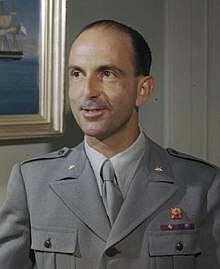 9 Mey 1946 – 12 Juin 1946: His Majesty The Keeng o Italy. 12 Juin 1946 – 18 Mairch 1983: His Majesty Keeng Umberto II o Italy. This page wis last eeditit on 23 Dizember 2018, at 23:43.